Don't sneeze -- you might blow away a newly discovered species. Scientists have uncovered seven new species of teeny-tiny frogs, each smaller than a thumbnail, in the Brazilian Atlantic Rainforest. The miniature frogs live on isolated mountaintops in the cloud forests. The mountaintop habitats are like isolated islands, making the frogs vulnerable to threats such as climate change. Illegal deforestation and cattle ranching also threaten the frogs' habitat, researchers report Thursday in the journal PeerJ. The new Brachycephalus mariaeterezae, for example, is bright orange with light-blue splotches along its backbone. Brachycephalus olivaceus, true to its name, is the color of a greenish-brown olive. 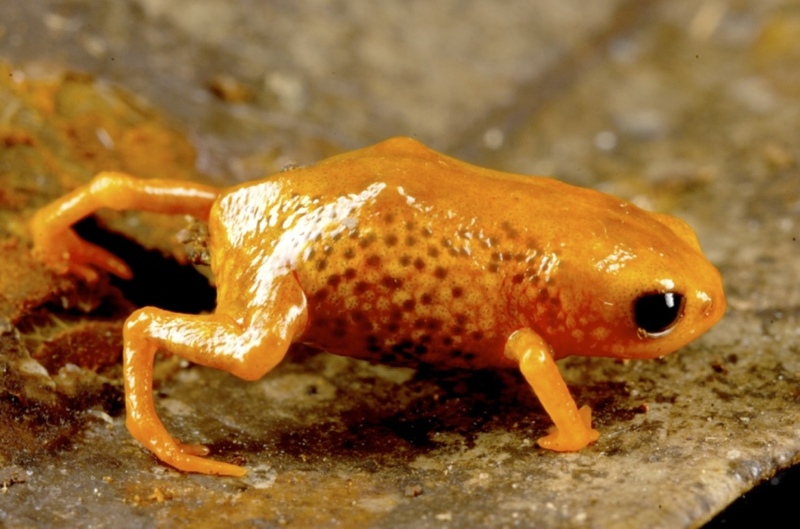 Brachycephalus auroguttatus sports a bright-yellow head and coloration that fades to brown limbs ("aurogattatus" translate to "gold drop" in Latin). The warty Brachycephalus verrucosus is orange with brownish-green bumps, and shares its uneven complexion with Brachycephalus fuscolineatus, which has yellow skin and a dark green-and-brown stripe down its back. Brachycephalus leopardus gets its name from its yellow skin covered with dark spots; researchers observed one of these frogs piggybacking on another as part of the mating process called amplexus in which the male climbs onto the female's back so he can fertilize her eggs as she releases them into the water. Finally, Brachycephalus boticario is orange with darker, bumpy flanks. All of the frogs were found living in leaf litter on the forest floor. "Such high success in uncovering new species might indicate that the total number of Brachycephalus is still underestimated," Pie and his colleagues write in PeerJ. The frogs' mountainous habitat is key to their diversity. Separated by valleys that the frogs cannot traverse, the pipsqueaks end up living in isolated communities, interbreeding until they evolve into completely separate species from the frogs a mountaintop over. "This is only the beginning," study researcher Luiz Ribeiro of the Mater Natura Institute for Environmental Studies said in a statement, "especially given the fact that we have already found additional species that we are in the process of formally describing."